Lineage is the unique transmission of a living energy from teacher to student. Lineages exist in many traditions, particularly in the martial arts, healing arts, yoga, and spirituality. Visit the Movement Center website today to learn more about how you can integrate these teachings into your life. Lineage is the transmission of a living energy from teacher to student. Lineages exist in many traditions, notably martial arts, healing arts, yoga, and spirituality. The lineage represents an unbroken chain through which accumulated knowledge is passed from generation to generation. An authentic lineage is a source of potency, through which one can experience the full benefits of spiritual practice. A spiritual teacher is someone who, in almost every instance, has been the student of a real guru. As students, they have spent years studying and practicing the techniques and methods transmitted by their gurus. They have carefully cultivated to a one-pointed focus a deep understanding of the highest power that dwells within. If such a person comes from a lineage and represents a respected tradition, then we have assurance that they have been well trained and are teaching from their genuine experience. Furthermore, if such a person has been empowered to teach by a guru, then it is because they have been recognized by their predecessors and peers to possess a profound inner gift. The lineage held by Swami Chetanananda originated with Bhagavan Nityananda, one of the greatest Indian saints of the last century. Nityananda, whose name means "bliss of the eternal," lived in southwest India from around the turn of the 20th century until 1961. Details of his early life are difficult to verify, but from the 1920s until his passing, he was surrounded by an ever-increasing number of disciples and devotees. By the late 1930s he was established in Ganeshpuri in the countryside near Bombay (now Mumbai), where an active ashram developed around him. Nityananda would come into a small room in this ashram which was lit by a few bare electric light bulbs, and sit there quietly with his eyes open. People would come from all distances to see him because, in India, the mere viewing of a spiritual teacher, called darshan, is considered a profound and important blessing. Nityananda would sit in this space with his eyes open, simply establishing a connection with each visitor according to his or her capacity to experience and sustain that contact. Nityananda was well known in the districts of Maharashtra and Karnataka, where he is revered to this day. In its essence, Nityananda's teaching is profoundly simple. Like the ancient sages of many traditions, he said that anyone who merges the individual into the universal is an enlightened person. To realize the universal nature of one's own individual consciousness is the goal of sadhana (spiritual practice). However, it is hard to describe Nityananda's greatness to most Westerners since his most profound achievements were internal. He never explicitly identified himself with a particular spiritual practice or tradition. In fact, he rarely spoke at all. The thousands of people who came to see him did so because in him they experienced the miracle of pure consciousness in human form. Such a holy person is called an avadhut. Timeless and eternal, the avadhut is a direct link to the absolute, encompassing all teachers who precede him and all who follow. 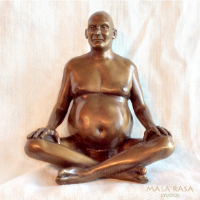 We now have a source for beautiful statues of Bhagavan Nityananda made using the traditional five metal process. A portion of the proceeds of each sale is donated to The Movement Center. You'll find more information here. We have created a site dedicated to Nityananda's teachings and stories about his life. Visit nityananda.us to learn more about him. One of the thousands of disciples who made their way to Ganeshpuri in the late 1950s was an American named Albert Rudolph (“Rudi”). Born in Brooklyn, New York, Rudi had been actively pursuing his spiritual development from a young age. At age 30, he was at a crossroads in his life when an associate took him to meet Nityananda at his ashram in Ganeshpuri. 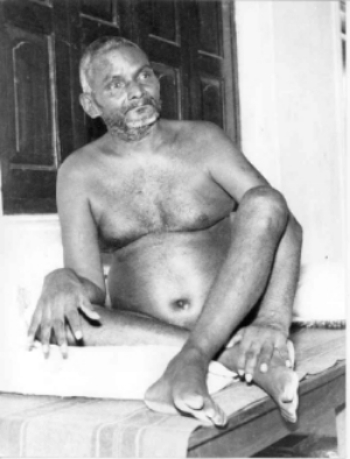 Rudi wrote, "My first meeting, in India in 1958, with the great Indian saint Bhagavan Nityananda was of such depth that it changed the course of my life." Rudi continued to study with Nityananda, and after Nityananda's mahasamadhi in 1961, traveled regularly to Ganeshpuri to visit his shrine and to study with Swami Muktananda. In 1966, Swami Muktananda initiated Rudi as a Swami into the Saraswati order, naming him Rudrananda, or "bliss of Rudra," a fiery and early aspect of the Hindu god Shiva. One of the first Americans to be recognized as a Swami, Rudi came back to the United States and established many ashrams across North America and Europe. Rudi was instrumental in exposing many Americans to the spirituality and rich cultures of the East. He had a deep respect and appreciation for these different spiritual and cultural traditions and saw a need for them to be presented in a way the West could comprehend. Though recognized as a Swami in India after many years of study, he was not as concerned with the form of Eastern tradition as he was with the content. Rudi saw the art and culture of Eastern spirituality as the symbol of something profound and universal, a truth that cut across all cultural boundaries. To that end, Rudi's teaching was direct and to the point, transmitting his profound understanding with a style that was uniquely his own. The foundation of Rudi's teachings was based on a deep personal wish to grow spiritually. Rudi talked about this wish to his students constantly. He described how a sincere wish to grow would lead to a deep and intense feeling which, as it matured in an individual, would evolve quite naturally into a deep love of God and of life. According to his teachings, a shift will happen as this wish to grow would be further transformed into a deep state of surrender. To grow spiritually, Rudi taught that we must live and work in the world from a deep internal state of surrender without any exceptions. Rudi passed away in 1973. Before he died, he designated Swami Chetanananda as his successor. Swami Chetanananda established The Movement Center to carry on Rudi's work. We have a created a website dedicated to Rudi that has more in-depth information about his life, work, and writings. Visit rudi.org to learn more about him. In addition to studying with Napdra Rinpoche, Rinpoche has received transmission of the entire Longchen Nyingthig teachings, an important tradition in the Nyingma school, and the complete teachings and practices of Padampa Sangye, a great Indian mahasiddha who is credited with bringing Chöd practice to Tibet. Swami Chetanananda met Rinpoche during a trip to Nepal in 1997, and they both describe their first encounter as the meeting of two currents. They immediately recognized the authenticity of the other’s spiritual work and the complementary nature of their practices. Since then, they have spent extensive time together, sharing knowledge and experiences. Rinpoche has practiced with the Movement Center’s students, given teachings and initiations, and worked on translations of texts from Padampa Sangye, Machig Labdron and from the Longchen Nyingthig tradition. In March 2003, Rinpoche attended teachings by His Holiness the XIV Dalai Lama in Dharamsala, India. During that visit, His Holiness told him that the Zhi-je teachings of Padampa Sangye, including practices for the pacification of suffering, were especially precious and relevant to contemporary conditions. His Holiness asked Rinpoche to establish a monastery in Kathmandu to continue these teachings in Nepal. The monastery, Pal Gyi Dingri Langkor Jangsem Kunga Ling, was officially consecrated in November, 2004. Audio and video recordings of Rinpoche’s performances of the Chöd, Phowa and Kusali Tsok are available from Rudra Press. More information about Rinpoche and a complete biography can be found at Rinpoche’s website.